I am currently a student at a tech school and otherwise unemployed. I’ve never been a scientist or published a paper. I figured that I should probably learn as much about research as I can before I do any experiment. On the other hand if I learn how exactly the others did their experiment that would bias how I construct mine. I would be prone to solving problems by doing the same thing rather than coming up with a new way to test it. So does it make any sense to limit the study of existing experiments for the sake of more diverse testing, or should I try to learn as much about them as I can? You should write down your thoughts now, then get on and do the proper research, before trying to do any experiment, if you wish to be taken seriously. While there is a need for radically different ideas, most research succeeds by following what has been done before ('standing on the shoulders of giants'). It is very unlikely that you will come up with something amazing without any reference to all the other intelligent people who have thought long and hard about the issue. If you did come up with something, but without reference to any other work, the likelihood is that you would be seen as a 'nutcase', or at least viewed with deep suspicion, until you could explain yourself very clearly. Your research should not be about simply accepting what others have said. You should think critically about it, and question their assumptions and conclusions. For the most part, you do not find new ways of doing things by working in isolation, but by looking at what others have done and making different choices where you aren't fully convinced by the justification for their choice. In many fields, finding good methodology was a long and tedious process. You gain nothing by repeating this process, if you can manage in one life time at all. However, if you do not use a reasonable methodology, your research will likely be without value. For example, consider that you have twenty drugs and try to investigate whether any of is good for the common cold – without any knowledge of methodology going beyond basic statistics. You might do something like testing each drug with hundred test subjects suffering from the common cold and consider the drug good if it is significantly more than half of the subjects state that their condition has improved after a few days. When doing so, your research is completely useless as you ignored the placebo effect, multiple testing, the final duration of the disease, and the unreliability of self-reports. Without any knowledge about previous research, you would not be able to identify all these mistakes on your own. Just consider all the adherents of esoteric healing methods, whose beliefs are typically based on such mistakes. That being said, you should not blindly accept established methods, but try to understand why they are the way they are and assert their validity on your own. This is not only a relevant control mechanism but it also makes you aware of the methods’s limitations – which is a relevant when applying them. As already suggested, you should probably write down your current ideas as well as any that arise when studying existing research, and evaluate them afterwards. Chances are that your approach is either flawed or a reinvention of the wheel. Get used to thinking about what you want to accomplish first, before thinking about who it is going to bother! Yes, I know this advice may not be categorized as academic per se, but try it out, nevertheless, please. I have been in situations similar to yours when trying to present out-of-the-box research to scientists who bare the title "experts" in their respective fields and if I learned something it is to never let anyone else decide the faith of your research. If you manage to raise in yourself the awareness of exactly where and how you stand defending your position with facts, rather than opinions, than, this is all you will ever need! I know there are many topics in today's science when the public tries to get in the way and when people (mostly paid by parties who have nothing to do with academic institutions) are doing everything they can to convince everyone fictions are facts and vice versa but I believe there is only one reality and we are all living in it! I know I may sound trivial but I will advice you to adopt this principle when browsing through literature no matter whether if it comes from academia or not. Although everyone tries to shout otherwise, I myself do not believe academic journals are "safe heaven" for serious research only and parties who have the means can get their way there, too. This means you should build a kind of "compass" in your field as to what is likely the reality behind the observed phenomena and what is the position people with enough money are trying to put up for the whole world to see. Then, the important step comes-compare your compass with reality itself. This is where your experiments should come. If they work just fine, than probably you are on the right track to reality and somebody is paying money to somebody else somewhere in academia to silence something. If it turns the other way around-then, it is you who are out of touch with reality. At the end of the all ends-There is only one world we all live in and everything else are private parties trying to wear "the academia skin". But no matter how much money and influence they could amass nothing can compare with observable experimentally verifiable data. I think this is all there have always been to the matter and if you manage to garner that sense of what you can prove and what you can not, than, you could manage the challenge of browsing through any source. A methodologically sound study or experiment design must be free of biases as much as possible anyway. This means that no matter what you read or know, you have to pay attention that your biases (or the biases of prior research) are not reflected in the study design. I recommend you take a research-methods class and study the scientific method, statistics, behavioral study design, etc. on a more generic level before you get started with research. Learning about these things will also enable you to evaluate prior research better. You will for sure not be able to publish your results without including in your paper a review of previous work on the topic. You will have to read and write about all sorts of previous work. This doesn’t mean you should take them for granted. In fact, if you focus on a specific bias or limitation that is problematic in previous work, and conduct a study that addresses it properly, that may be easier to execute and publish, compared to a completely novel angle. It is highly probable that at some point, somewhere, some other researchers have noticed the issues you are noticing, and addressed them. This may be work that is dedicated to the issue; but you may also find this in a section (usually named limitations or discussion) in a paper about a study where the issues are evident. If you are just getting started on this topic I would actually suggest that you write up a literature review on the topic – survey the papers written before, summarize them, highlight important findings, point out issues, etc. Write it in the form of a paper. Even if you don’t get to publish it (which you may try), you can recycle it to provide background in an original research paper. My experience has been that the danger of bias is much smaller than that of ignorance or of result duplication as lots approaches to a problem are obvious enough that nearly everyone tries them first; one must (I think) examine other approaches to find out what doesn't work so as to avoid wasting time. One cannot be original except by avoiding other approaches (especially the failures) or at least modifying them to work better. You can eliminate bias by noting down your own thoughts before starting and keeping notes of your approaches and why you took such a path. TL;DR: No, read as much independent sources as you can. While one might (maybe rightfully) accuse you of looking for a justification for omitting a proper literature review. There is a philosophical part to this question. Which reinforces the study of previous research. While it is self evident that a contribution to a field of research needs to contain something new (this might very well be a new data-set), there exists the possibility that available data already falsifies your research. So in order to be sure that your theory/contribution was not already falsified you need to be aware of the rest of the research. 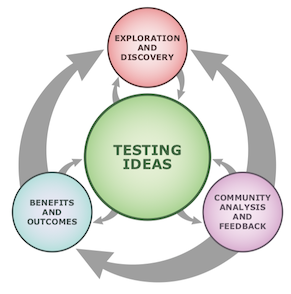 Science is a adaptive in that the outcome of a test might be interpreted differently based on the community which performs the test/analysis. Both approaches (limited and extensive review of the available literature) will influence the way research will be conducted and both approaches allow for biases to interfere with the research. Assuming that everyone is biased to a certain extend by the experiences of once life the limited study does not prevent biases it just does not add new ones. Since biases threaten the research in both scenarios it is necessary to prevent (or limit) their impact through awareness and transparency. Conclusion: In order to maximise the scientific value of the research a comprehensive knowledge/study of the available research is necessary to ensure novelty. Not the answer you're looking for? Browse other questions tagged research-process literature-review methodology experiment-design or ask your own question. How to avoid thinking about research in free time? If one wants to generate several papers from a single research project, what is a reasonable way to do so? Do reviewers become biased about research papers written by authors of a previous low quality paper? How to balance previous works and current idea in a research plan? Study design for best teaching methods - how to avoid overly specific results?